We’ve seen before what happens when Kevin VanDam gets on a roll. After his dominating wire-to-wire victory on the St. Lawrence, he’s officially on a roll. The victory – the 24th of his career – was his third in the last two years. That comes after a five-year stretch without a victory, and made even more noteworthy when you consider KVD went on a five-year streak prior to that with at least one victory (and often multiple). 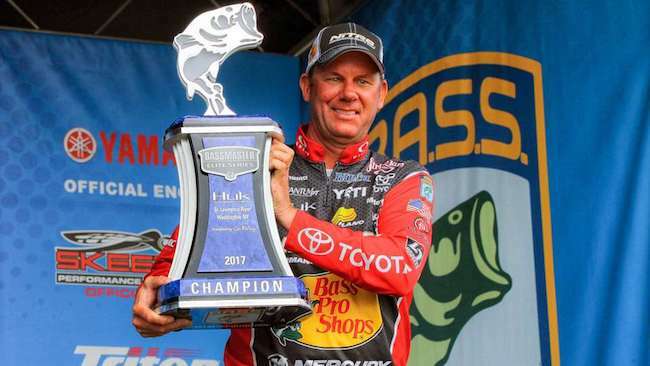 Since VanDam broke his victory slump at Toledo Bend in May of last season, he has seven more top 10s, including the two more victories, in 14 events. He only had nine top 10s in the five years between his 2011 victory and 2016 victory (more than 60 events). As we’ve documented, during that five-year slump he very nearly fell outside the top 100 in our Majors Ranking. But the former No. 1 is now back inside the top 30, sitting solidly in 26th. There are three Elite Series events from 2015 set to drop off in August, and all are weighing down his average. As they drop, and if he finishes the season strong, it’s feasible he could be knocking on the door of the top 10 once again by the end of this year. Speaking of the top 10, Brandon Palaniuk officially cracked it for the first time in his career. He’s always had some impressive wins, but he’d been an all-or-nothing angler early in his career. In his sixth season, he’s found consistency. In fact, he’s made five top 20s in a row, and if not for Okeechobee event in February, he’d probably be in the top five.